Full Body Health Checkup in Jaipur – the best price ever! Jaipur, The Pink City is turning its colors. Being the capital city, Jaipur comprises of a population of 3.628 million (2017) and is one of the popular tourist destinations of India. Have you noticed lately the pollution levels in Jaipur? According to WHO’s (World Health Organization) report, Jaipur is the most polluted city of Rajasthan. The shift of the burden of diseases from the communicable to non-communicable diseases is evident and the city is feeling the heat of the lifestyle diseases in the form of cardiovascular diseases, COPD (chronic obstructive pulmonary diseases), cancer, diabetes, kidney and liver diseases and more. The quality of life in Jaipur due to these chronic diseases has given rise to distressing numbers of mortality and morbidity. With the current heath status, where people are suffering from life threatening diseases, people of Jaipur need full body check-ups regularly to keep a track of their health and prevent themselves from the ailments that may turn into lifestyle diseases in near future. Diabetes and hypertension have become common conditions of life and people take it very lightly these days. But, these are the two conditions of the body that give rise to many other associated lifestyle diseases. So, having a regular whole body check-up will not only help diagnose lifestyle and non-communicable diseases early, but will also help you save thousands on the treatment costs that you incur to cure few deadly diseases like cancer. Do not wait! Book your appointment today for a full body health check-up in Jaipur at the nearest diagnostic center at the best lowest price. What do we know about Jaipur? Jaipur is the capital city and the largest city of Rajasthan. It is well known for the socially rich legacy and forms one of the most visited tourist destinations and is also a part of the “golden triangle” in India. Jaipur being ranked one among the 50 Emerging Global Outsourcing cities is a hub for many business and employment opportunities. Tourism, gemstone cutting, manufacturing of jewellery, luxury textiles, hand-knotted rugs, and information technology industries attract different set of population from all over the world. Besides from being a great place to visit and live in, the city faces its own set of issues. The pollutions levels being on the higher edge, the city also faces issues of water hygiene and falls prey to many vector borne diseases every year. How healthy can an individual be termed in this condition of atmosphere? Pollution being one of the factors affecting the health of the people in Jaipur, there are also factors that have devastating effect. The number of people dying due to heart ailments is highest in Jaipur and the deaths due to respiratory disorders stands second, where the number is higher than the national average. 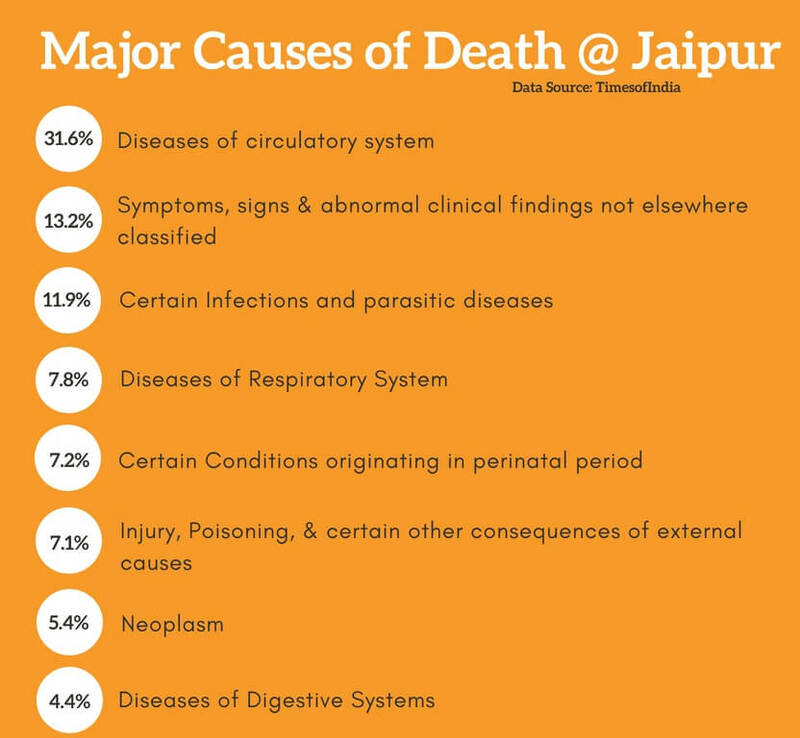 The report ‘medical certification of causes of deaths-2014’ suggests one out of every five people die because of the circulatory system disease in Jaipur. Other factors like hypertension, stress, consumption of tobacco and alcohol, physical inactivity and changing lifestyle and dietary habits have had great effect of the current health conditions. Jaipur popularly known as “the pink city” is not in the pink of the health. Let us have a look at some prevalent diseases in Jaipur in the next section. Rajasthan has poor hygiene in many regions, hence food and water-borne diseases are quite common in many areas of the state. Non-communicable diseases remain a public health problem in many of the states in India. Jaipur is also under this epidemiological transition and the burden has shifted from communicable diseases to the new era of lifestyle chronic diseases. The city faces challenges in preventing diseases such as cancer, heart attacks, strokes, diabetes, kidney and liver diseases, endocrine disorders, chronic bronchitis and asthma and severe COPD. The prevalence of coronary artery disease (CAD) in Jaipur was estimated to be 6% in men and 10% in women in 2002. The number is expected to have reached a double digit by 2018 to 6%. The leading risk factors for CVDs are considered to be diabetes, hypertension or high blood pressure and obesity. COPD ranked seventh in 1990’s. The disease has taken a jump to the second position with the number of deaths increasing to 7% from 4.4%. Cancer data from Rajasthan is very limited, and only three studies have been published so far in the last decade. According to a retrospective study on the prevalence of different types cancer conducted by the Department of Oncology, S.M.S Hospital, Jaipur, from 1st August 2013 to 31st July 2014 showed that a total of 4587 whole body malignancy cases were reported. Among which, head and neck cancer (17.96%) had the highest prevalence followed by genitourinary tract cancers (14.55%) and gastrointestinal tract cancers (11.67%). Among the females, cancer of the breast (25.6%) was very common, followed by genitourinary tract cancers (20.27%). The factors affecting the prevalence of these diseases are considered to be metabolic risk factors like high blood pressure, blood glucose, cholesterol and obesity, and few behavioral risk factors like consumption of alcohol, tobacco, physical inactivity and other socioeconomic problems. All these risk factors have increased the magnitude of the incidence of the chronic lifestyle diseases over a period of time in Jaipur. Jaipur faces living challenge and healthcare needs of many unmet. Rajasthan is the largest state of India with around 17% of the population living in Jaipur. As per the latest census report, more than 7 lakhs of people are dwelling below the poverty line in the city and there are as many as 250 slums in the city. Since slums are usually overcrowded, the people of these areas face several problems such as shortage of living space, shared facilities, inadequate supply of water and unhygienic living conditions. A report on the quality of water in Jaipur suggests, “Atleast 70% of Jaipur receives water with a high concentration of TDS or contaminated by bacteria or both”. But the outcome of the report says, though the water is bacterially uncontaminated, the concentration of calcium, magnesium, hardness, TDS and alkalinity levels above the acceptable level does not sham any serious threat to most of them, although few are at risk. The place not only faces the problem of communicable diseases like TB, asthma, and other vector borne diseases, but also is burdened with most of the non-communicable diseases. This is due to improper accessibility to healthcare services and most of these diseases go undetected till the last stage where treatment costs are sky high, which is again a question of affordability. The higher number of slum population survives on a very low annual income and meeting the healthcare expenses becomes a big challenge to most of the families. Rajasthan is also counted as one among the BIMARU states where most of the people are health deprived due to several reasons. According to an article published in Times of India, published last year, Rajasthan government spends only Rs 904 per capita on health and most of the healthcare expenses in the state are borne by the people themselves as out-of-the-pocket expenditure. Primary healthcare is the only way people can afford healthcare services in these states, but there is a huge gap between the requirement and the delivery of these services. Most of the healthcare services in Jaipur are ill equipped in terms of human resources and other infrastructure, where many of the healthcare and diagnostic needs are unmet. How can full body health check-ups help “act preventive”? Jan Swasthya Abhiyan (JSA) pointed out that most of the healthcare expenditure in Jaipur is out-of-the-pocket, and this situation needs immediate attention. The high load of diseases, and the low spend on health comes as an evidence for the ongoing high burden of chronic and lifestyle diseases in the city. There is an ongoing debate between the government and the JSA for the public-private partnership in the healthcare services. The public healthcare services are affordable but do not meet the required standards, where as the private healthcare services meet the required standards and provide better treatment options, but are hardly affordable. In such situations, keeping yourself informed about your health status by investing a minimal amount on preventive whole body health check-ups in Jaipur may be of a great help. Bookmyscans, has reached Jaipur to help the people meet their diagnostic needs in the form of Full body health check-ups at affordable prices. This complete medical test list of diagnosis will not only help the people of Jaipur to act preventive in keeping the track of signs and symptoms of chronic lifestyle diseases that can be easily prevented, but also help in early detection and diagnosis of diseases like cancer, which need a huge amount during treatments. A complete body health check-up includes a set of tests like blood, urine and few other imaging tests. These basic tests help the doctor analyze the current condition of the patient, along with diagnosis of early symptoms of different health conditions. The test list consists of examinations performed like Liver function tests, Cardiac Risk Markers, Iron Deficiency, Thyroid, Vitamin, Toxic Elements, Lipid, Pancreatic Profile, Electrolytes Profile, Kidney, Diabetes Screening and Complete Hemogram, including cancer screening blood tests as a part of few packages. Take the privilege of the best quality diagnostic services, nearest to you and at best affordable prices. A full body health check-up is very beneficial because it reduces the healthcare costs, helps keep ready health records in emergencies, prevents deadly diseases along with timely diagnosis and treatment, creates awareness about your body condition and helps in better control over problems like hypertension, high blood pressure, weight problems, diabetes, depression, mental disorders, and gastrointestinal problems. Bookmyscans can help you get the best full body health check-up in Jaipur. Bookmyscans is one of the best online guides that provide information about the full body health check-ups in Jaipur. We are user friendly, convenient, accessible and affordable. We partner only with diagnostic centers that are approved by AERB and certified by ISO and NABL and that are equipped with standard and technically compliant and safe testing tools and machines. We also audit our partners regularly to make sure they maintain the technical competence in the market and provide timely and quality services. We have been able to help more than 100,000 people all over India get access to the best healthcare services and also save more than 43.2 crores so far. Now, we reach Jaipur to extend our services to the population that has not been able to meet their diagnostic needs due to limited accessibility and affordability. We are transparent in our services and we assure you the best price for full body health check-ups in Jaipur. Our technical team will reach to you for the sample collections at home and you will be directed to a nearest diagnostic center for the scans.